Last year, Kansas Citians had the privilege of hosting the Dead Sea Scrolls Exhibit. It was a wonderful opportunity and I am very thankful that I went to view them. However, the most impactful moment for me during the tour was not viewing the scrolls themselves. There were only about 10 scrolls shown, and while it was neat to see the authentic originals, the small display really was not as interesting as reading about the scrolls and viewing pictures in primary source journals. However, there was one moment in the exhibit that took my breath away and brought me to tears. Prior to arriving at the rooms with the scrolls, several rooms were set up with other artifacts from the 1st century. As I was gazing at a pile of ancient coins, one of them caught my eye. It was a Roman coin issued in honor of the Roman victory over Jerusalem. 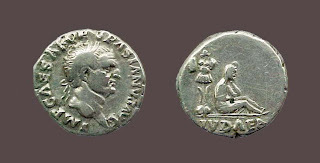 It was very similar to the coin in this photo (click image to enlarge). You will notice in the right image, there is a woman seated and weeping with “Judaea” written below her. She is representative of the Jews defeated after Rome sacked Jerusalem. However, notice the figure next to her. This form is called a “trophy” in the ancient world. It is formed from the weapons and military dress of a soldier who was killed. The victorious army would disarm their enemy and set up these trophies as displays of their victory. Seeing this coin in person brought about many emotions. First, there were the tears when I considered that this was a primary source example and testimony of the wrath of God against the Old Covenant people. The prophets spoke of this event, and our Lord told his disciples that Jerusalem would soon be leveled. As such, this coin brings fear to my mind. God is powerful and His wrath is certain towards those who are not covered by the atoning blood of Jesus through faith in the Gospel. Col 2:14 having canceled out the certificate of debt consisting of decrees against us, which was hostile to us; and He has taken it out of the way, having nailed it to the cross. 15 When He had disarmed the rulers and authorities, He made a public display of them, having triumphed over them through Him. This passage speaks of the work of Christ on the cross. In verse 15, our translations often struggle to convey the idea that is clear in the original text. The NASB, as shown above, states “He made a public display of them”. The words “public display” lead English-speaking readers to think of some abstract idea instead of the very concrete and powerful meaning of the original text. The word used in this passage is the word for the “trophy” in the ancient world as described above. The vivid picture of the text is that Christ has conquered his enemies (and ours). He disarmed them, just as the Romans disarmed fallen Jewish soldiers, and He made a trophy of their remains. In verse 14, we see this was done through the work of Christ on the cross. The cross is Christ’s trophy. It is there for all to see that He is victorious and that He has defeated the enemies of His people! We ought to rejoice and know that He is Lord! Amen. Sell your shirt…buy a book! About two weeks ago I received my copy of the Commentary of the New Testament Use of the Old Testament, edited by D. A. Carson and G. K. Beale (great biblical scholars only use initials – no first or middle names). It is available at Amazon for about $35. So far, I have been very impressed. Of course, I’ve only read about 30 pages of the 1,239 that are in this book, but those 30 pages have already proven to be more useful than any study Bible and almost any commentary in handling the context of the OT quotation and the intended meaning of its use in the New Testament text. Each chapter is written by a different scholar, so some variety of quality and theological position may be expected, but the breadth of research in the volume appears to be second to none. Sadly, as a scholarly reference, there is the token discussions of some issues that deal with higher criticism, so you may have to let your eyes glaze over as you flip past some of the introductory material to each New Testament book and get to the good stuff. With that said, I would highly recommend this resource to you as a tool for biblical study. Hopefully, you will find it useful as well. Last night we met and looked at 1 Peter 4:7-11. It was good to be together again on a Wednesday night…we have missed the last two weeks do to illnesses. The text led us into a very honest discussion of the seriousness of this life. As the passage says, we are to be sound in judgment and sober minded for the sake of prayer, especially in light of our duty towards one another as fellow resident aliens in this world. Therefore, we must exercise fervent love for one another. We must view our lives as critically important and use our speech and our deeds to build one another up, knowing that we should reflect the power and the glory of Christ through our conduct towards one another. Hence, the passage ends the exhortation to this godly conduct saying that our lives must glorify Jesus Christ in this manner to show forth the glory of His power and His dominion. Let love therefore cover our sins. Let us not give up on one another. Let us not turn from one another, feeling betrayed, feeling as if others have failed us. As we discussed last night, such love is beautiful and it ought to be the desire of our heart to seek this godly love which will carry us forth while we are still pilgrims in this land. This text has led me to consider the blessings in my life through those in the Church that have shown me and my family hospitality; who have served and ministered to us in our times of need and throughout our lives. May God be praised for the power of His Spirit in the Church! Free Resource of the Day! In case you were not aware, David has posted a great resource on his website that lists Old Testament quotations in the New Testament (compiled by Michael Marlowe at Bible-Researcher.com). This month has given us at Heritage much to celebrate, namely our 10-year anniversary. We had a special time this past Sunday and met for lunch after the service with a spread of barbecue and lots of fun for the younger ones at Dave’s Gymnastics Factory. The fellowship was delightful and the kids provided great entertainment as they raced through an obstacle course and dove off the trampoline into the foam pit below. It was great to have John Carpenter from Camp Del Haven join us. But much more important than an afternoon of food and fun, this month has given us time to reflect on the years of God’s provision and grace toward us. We have been blessed with unity, love, and service together. None of this is possible as the result of our own efforts, but it is a demonstration of the power of the Spirit of God. May He continue to bless us with this fellowship! As a believer in the Gospel of Jesus Christ, I am immersed in a heritage that is as wide as the ends of the earth and as deep as the eternal decrees of God. The Holy Scriptures contain the the glorious promises and works of God; the testimony of the Law and the Prophets; and the glorious unfolding of the New Covenant. The history of the Church has provided my library with volumes of exposition and devotion. My life has been filled with my friends and mentors in Christ who have taught, encouraged, and challenged me with powerful and effectual testimonies. For what reason then could I even begin to think that I could have something to say that hasn’t already been said? I have offered to edit this blog not in order to present something more eloquent or wise than the thoughts of others, but I am convinced that there cannot be a reason to silence even the humblest of voices that speak of the greatness of the Lord Jesus Christ. That then, is the purpose of this blog…to be a testimony of the greatness of His kingdom. I hope to record that which has been impressed upon me and the thoughts of those here at Heritage Baptist Church. I am continually amazed at the beauty Christ’s work in his Body, and the expansion of his kingdom as the light goes forth into darkness. So, whether this blog is read often or rarely at all, by the grace of God, I pray that it is at least a small display of another facet of the grand splendor of God’s redemptive work that is far beyond all that we could think or ask.